I bought some new clothes the other day and one of my favorite things is taking off the tags and wearing it for the first time. Not sure how to describe the smell of new clothes, but I'm sure you know the smell, don't you? Anyway, I mainly went shopping for Daryl and got him some sweet new rags at Vans. SAY WHAT!? I just freaking bought all that! I then remembered that previously before our marriage (back in the "dating days") he made a valid point that who knows who tried on those clothes and what they did to them in the dressing room. Well friends, I'm wondering who actually takes the time to wash something before wearing it for the first time. I know I sure don't unless it's thrifted of course. You know what would be funny if I get all responses saying that y'all do and we find out I'm the real nasty haha. Well I'm off to bed, I have a late night movie to watch with my man. See ya! 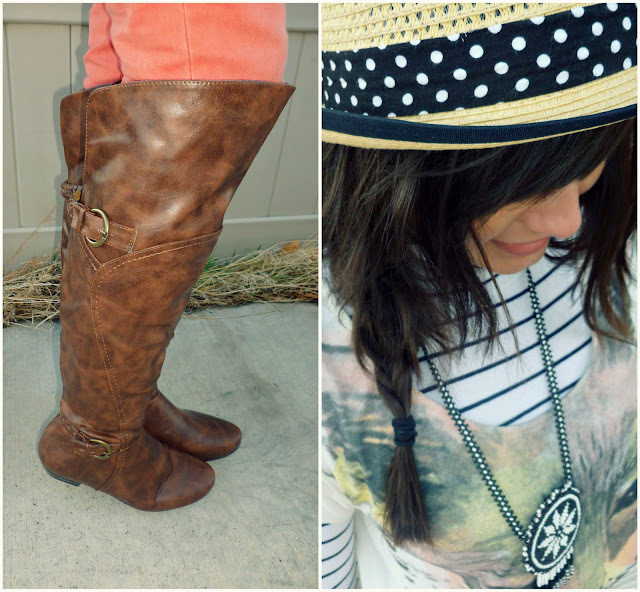 I love the fedora and boots by the way! And those jeans, beautiful color! this is funny. because before you mentioned daryl's reason for washing them i was thinking about CAROL and how she insists on washing them. but not because they might be dirty but because they aren't soft enough yet. back when we were dating, we'd come home with new clothes and IMMEDIATELY that woman would ask him for them to wash. i hate that. one time, she called and told me that she took natalie's crib apart (while we were having her at the hospital) to wash the bedding. i know you're busy. and i know you like it that way. haha you can't handle "time to craft" according to you. can't wait to see you. it'll be a nice break from everything, i'm sure. I never wash new stuff... It's new, therefore it's not dirty. Unless someone with too much makeup has tried it on and left marks on it. Then I wash it. hahaha...I rarely wash something after buying it unless it smells funny or is an undergarment. Just because what if it shrinks or something and then doesn't fit right ever ever again? That first unclean wear could be the only chance! I am dying over those coral jeans. Love love love. And those boots too! I love those pants - amazing! hahaha that's funny :) My mom tried to convince me once that thrift shopping was the same as new clothes shopping because new clothes are still tried on and previously worn. But, you look lovely, none the less and I LOVE your jeans! sometimes it depends. i ALWAYS wash thrifted clothes but if they're new and they don't smell freaky and i'm too in love with them to wait, i rock those suckers like woah. i'm in love with your fox shirt. 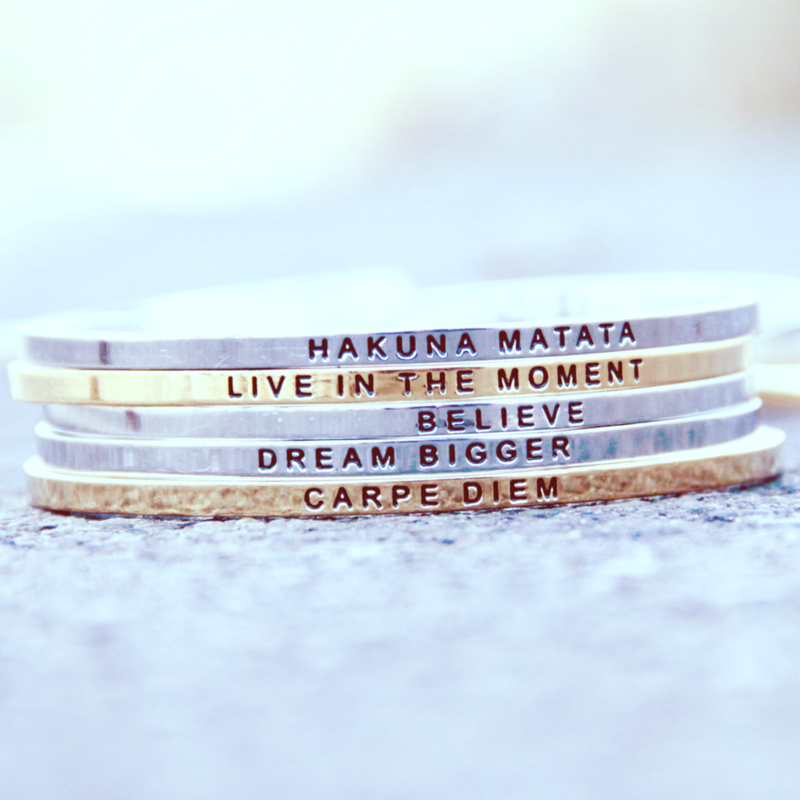 like IN LOVE with it. I only wash new stuff if it's super wrinkled. I'm too lazy to iron. Those jeans are AMAZING. What a great outfit! I don't wash new clothes before I wear them so perhaps I'm nasty too. I do wash my thrifted clothes though! Love the southwest vibe of this outfit. Your pants are a beautiful color! thanks for stopping by! Following you back of course! Cute outfit, I love your hat!! Hi sweety, thanks for stopping by my blog. You have the cutest quirky style, which I like very much! Hi!! I just stopped by your blog and I love your sense of style! I am following you on Google Friend Connect and Blog Lovin'. I would love it if you could check out my blog also, and follow if you enjoy! Unless the item is from a consignment store I'm wearing it brand new as it is. 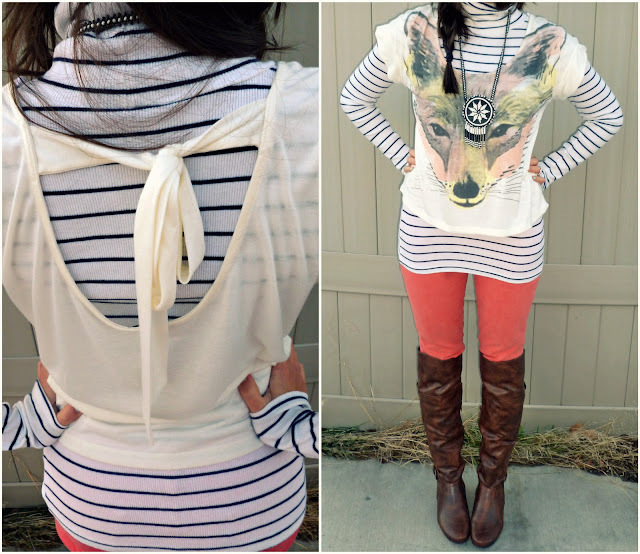 Love the layering and the coral jeans! I love how you've layered it! :) The cropped top is gorg! Could you please spare a second to vote for me ??? Love the colour of your pants so much! Cute outfit!! hi dear, i fell in love with your blog.. of COURSE i'm following back!!! ..love that outfit! sure i know the smell of new clothes, it is delicious! Lovely pictures and lovely style! I love the wolf shirt very much! I laughed out loud when I was reading your post because my husband and I literally had the exact same conversation recently. I have to say I'm with you girl. It's not only the smell, but the fit. I feel like the clothes fit me the very, very best when I've just bought them. I think that's probably just my own illusion, but the allure of cut the tag off and wear is still with me. GIrly....you are so cute. Can we swap buttons some time? The coral jeans! so cute I just maybe wish you were wearing shorter shoes to show off their great color more! love the outfit and especially the tshirt! Anyways, I am loving your outfit from head to toes!! So gorgeous, especially the boots and jeans! You look amazing! I LOVE those jeans!!!!! A.Mazing! Haha. Same about the washing thing. I remember someone brought that up to me once and I was like, what? Then I felt nasty for never thinking of it myself. And... still don't wash them. Love your blog and loooove those pants. I need me some colored denim. New reader! !